I woke up this morning and the ground was covered with snow. Even after all the signs of spring had come–robins, worms, one robust thunderstorm, and the premature donning of t-shirts and shorts in 45° weather—this is what we get? Yes . . . a big reminder of why Minnesota isn’t over-populated. Instead of crawl under the covers and groan, though, I’ve decided I’ll do my own version of a rain dance: some mighty Spring cleaning to let Mother Nature know that we’ve had enough winter. First stop? My studio. I like to call where I work “my studio” so it sounds fancy, but the place is just one of the bedrooms in our 1960s suburban split level. It’s where I do all my freelance work, both writing and designing, so I’ve done my best to make it functional for both the clean, left-brain activities I do as well as the messy, right-brain activities. 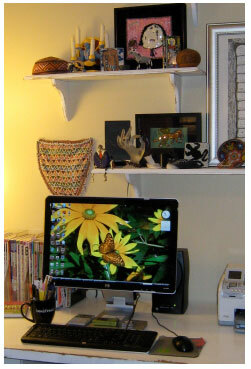 Since I spend so much time in my studio I’ve also worked hard to make it comfortable and creatively inspirational. I’m always looking for ways to make my space work better, though, so I sat down and read the Spring/Summer issue of Studios—a magazine filled with really clever ideas for organizing and beautifying your work space. 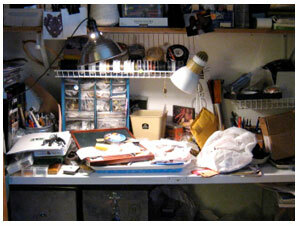 The thing I like most about this issue is the photos of other artists’s studios. It’s enlightening to see how other creative people solve storage, workspace, and display problems. I definitely needed this creative organizational boost to get motivated . . . maybe you do, too? Get Studios and be inspired! 1. Deal with the desk. There are papers and junk everywhere here! 2. Clean the beading table. One way I’ve been able to shut away the mess so I can concentrate on writing or editing is to put my worktable in this well-lit closet. The upside is I only need to shut the closet doors to hide the mess. The downside is it’s easy to leave the mess! Welcome to that mess. Today I’ll put errant beads back into their original containers, recycle old zipper bags and papers, deal with a new storage space for kit-making, and remove anything that isn’t jewelry-design related. 3. Overhaul the bulletin board. 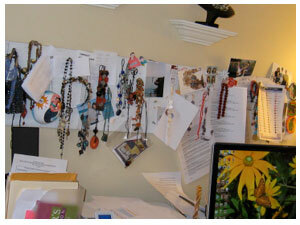 I’ve had the same pieces of jewelry, photos, materials, swatches, and notes posted on my corkboard for months. No wonder Mother Nature still thinks it’s still winter. 1. Neat, organized desk. I moved the desk to a completely different wall because my sister-in-law says it’s bad feng shui to have your back to a doorway. I think she’s right, because this setup feels much better. 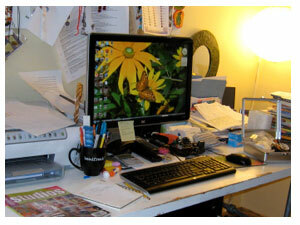 I also organized the junk, placing it in an old set of drawers tucked under the tabletop. 2. Workable, clean beading table. 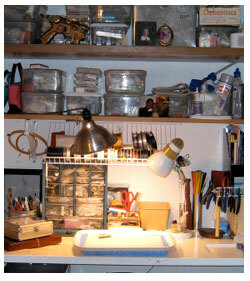 I cleaned up all the mess on the work surface, but the big thing for me here was that I moved the kit supplies I’d been shoving under my worktable to their own location along the wall where my desk used to be. Now I’ll have a nifty, clean place to make kits and I’ll be able to get my knees under my worktable while working, too. 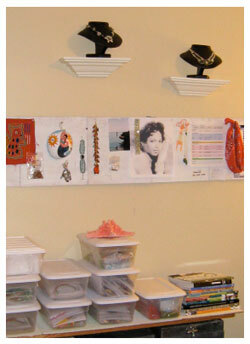 Do you have tips for organizing your craft studio? Share them on the website.